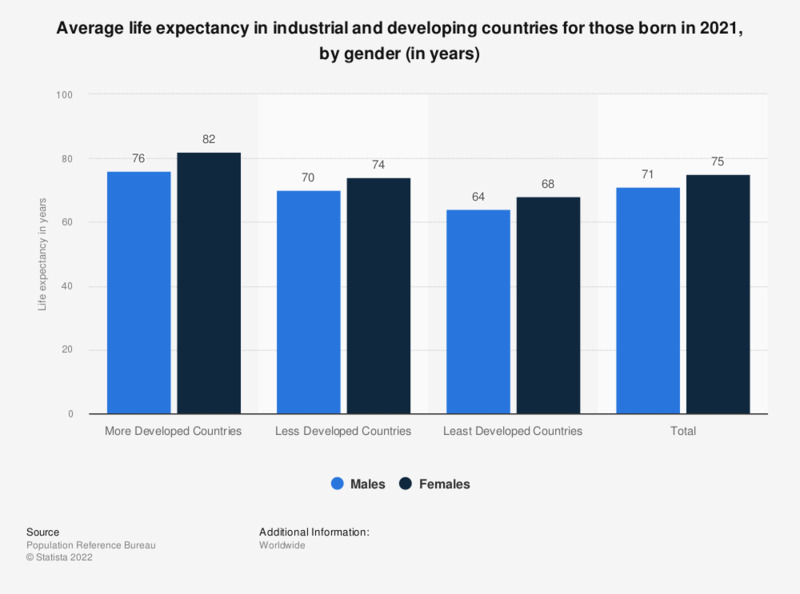 The statistic shows the average life expectancy in industrial and developing countries for those born in 2018, by gender. In the industrial countries, the average life expectancy was 82 years for females and 76 years for males in 2018. *Average life expectancy of a newborn according to the current mortality rate. **According to the United Nations, the industrial countries include Europe, North America, Australia, japan and New Zealand. All other countries and regions are defined as developing countries. According to the source the data from the above statistic originates from official statistical yearbooks and bulletins of the particular country. Moreover, publications of the United Nations, the Department of Economic and Social Affairs (Population Division) of the UN and the U.S. Census Bureau serve as data sources. Further sources are recent demographic studies, special studies and direct interviews with demographers and inquiries at statistical offices of the U.S. and other countries.